The earliest inhabitants of the district are thought to have been the Celtic Brigantes, invaders from mainland Europe, who may have buried their dead in the tumuli at Ludworth and left behind the standing stones on Ludworth Moor. The name "Ringstones Farm" in the vicinity does suggest the site of a Bronze Age Druids Circle connected with these stones but until recently there had been little physical evidence to support these theories. An amazing archaeological discovery in 1998 at Mellor has however, redefined the early history of Stockport, taking it back several millennia. The excavations at the site continued for 12 years, until 2010, revealing new and exciting information about our local history that is explained on the Mellor Archaeological Trust web site. It has always been considered unlikely that Marple itself was ever affected by the Roman occupants of Britain. Even though transport routes did pass nearby and hunting parties may have roamed the woodlands, it was thought that the Romans would have skirted the area at High Lane, on what is now the A6, on the way from the fort at Mancumium to the Roman Baths at Buxton. The same archaeological dig at Mellor has now proved this to be incorrect, with strong evidence that the Iron Age Fort discovered there was later re-occupied by the Romans as a small fort or signal station. Roman Lakes and the Roman Bridge in Mellor, built much later and given their names in Victorian times to attract tourists, now seem much more fittingly christened. The first mention of Marple and Wybersley is in 1122 in a deed concerning an exchange of land. About the year 1206, the Earl of Chester granted Marple and Wybersley to Robert de Stokeport for forest service in the Forest of Macclesfield, at this period the district was un-enclosed and included extensive woods in which the Earl of Chester still reserved the rights of hunting. These also served as a nesting place for the hawks and falcons which abounded the area. 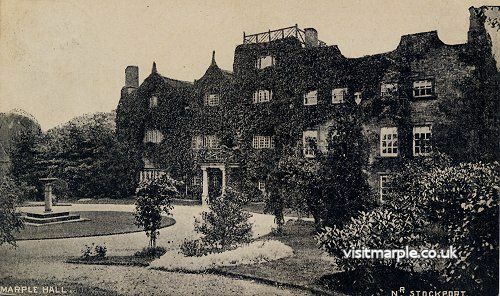 Robert de Stokeport subsequently re-granted Marple to his sister Margery in around 1220 and upon her marriage to William Vernon, the land became the property of the Vernon family where it remained for several generations. In 1398 the Feudal Lord Richard de Vernon was commissioned by King Richard II to raise a body of archers to serve in Ireland. The last of the Vernons to possess Marple and Wybersley was Sir George Vernon of Haddon Hall, better known as the King of the Peak. He died without male heirs and his estates were divided between his two daughters, Margaret who married Sir Thomas Stanley and the more famous Dorothy who married Sir John Manners. 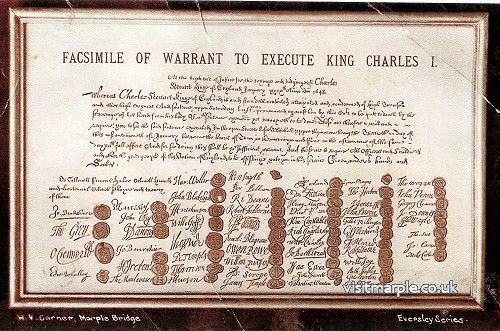 On the death of Lady Margaret Stanley in 1596 the area came into the possession of Sir Edward Stanley of Tonge. 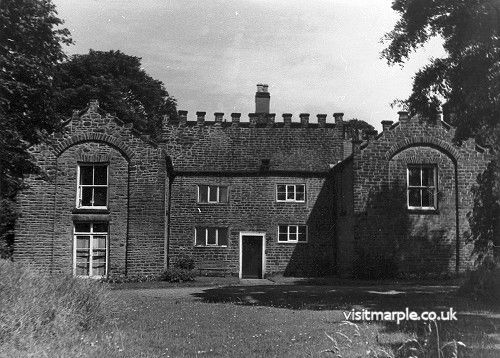 Sir Edward, the last of the Feudal Lords, having no male heirs, sold the manors of Marple and Wybersley off in small lots in 1606. Henry Bradshawe (I), grandfather of the famous John Bradshawe, purchased the Halls of Marple and Wybersley, together with 1000 acres of land for the sum of £270. John Bradshawe was the Lord President of the Court which tried and sentenced King Charles I to death on 27 January 1649. John's signature was the first on that well known death warrant. In 1650 he was made Chancellor of the Duchy of Lancaster but later incurred the wrath of John Bradshawe - Marple's most famous son by resisting the dissolution of Parliament in 1653. His last public utterance was a strong protest against the action of the Army in dissolving Parliament again in 1659. He died shortly after in 1659 at the age of 57and was buried with full honours in Westminster Abbey. In 1661 his body was dug up and hanged at Tyburn, his head was cut off and displayed in Westminster Hall above the seat where he had presided at the trial of Charles I.
Marple and Wybersley inhabitants, like others in the Forest of Macclesfield, had been subject to harsh forest laws which were gradually relaxed. Land was assorted and sheep introduced. A woollen industry grew up in the district as evidenced by the wages for workers in that industry which included sheer men and dyers which were fixed by the Justice of the Peace in the 16th century. Prior to the rise of Marple as an industrial community the male villagers were mainly small agriculturists with the wives working in the home either in linen weaving or hatting. Although there had been cotton manufacturers in the district before him, it was the coming of Samuel Oldknow to Mellor in 1790 that transformed the district. Not only did he establish his Mill by the River Goyt, he also sank coal mines, built houses for his workers, made roads, was instrumental in the construction of the Peak Forest and Macclesfield Canals and rebuilt All Saints Church. In 1797 Oldknow built the Lime Kilns, the picturesque ruins along the Strines Road. He introduced modern agricultural methods to the district and the legacy of his tree planting can be enjoyed today. Tannin from the many Aspen trees planted by him was used in the leather industry which he also introduced into the area. 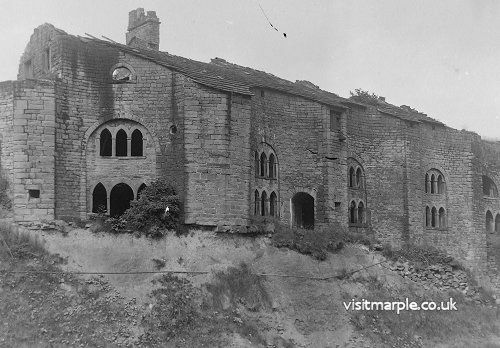 Marple Lime Kilns in the early 1900s. The Peak Forest Canal is carried over the River Goyt by an aqueduct which was commenced in 1794. It was known at the time as the "Grand Aqueduct", being 100 feet above the river and people came from all over the country to view this remarkable construction. The aqueduct, designed by Benjamin Outram who later invented the tram car, took 7 years to build and 7 men were killed during its construction. The Canals, the highest in England, did much to help Marple's growth and during the construction to aid road communications Samuel Oldknow built Posset Bridge - so called because the workmen engaged on it were given ale possets for breakfast to expedite its completion. Oldknow was a paternal employer. Both for his own financial projects and to ensure that his employees spent their wages to good purpose, he introduced the "Trucking system" issuing pay-slips to be exchanged for goods at "The Shop" at Stone Row. 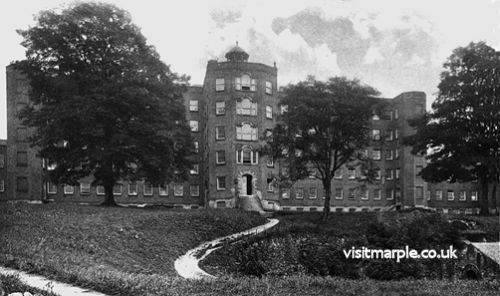 He used the apprentice system and housed the children at Bottoms Hall, where he also built a model farm. He died in 1828; his mill was destroyed by fire in 1892. The Carver family took over the Hollins Mill in 1859 and came to live in the "Hollins" previously occupied by the Walmsleys in what is now Marple Memorial Park. 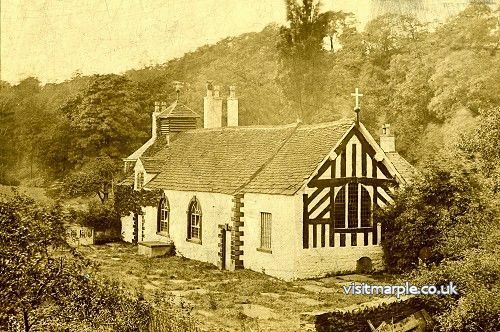 This was given to the people of Marple in 1922 by the Carver and Barlow families. When in 1865 the railway came to the area, the canal system lost much of its commercial usage. After a period of decline during which the canal and lock systems fell into a state of considerable disrepair, public interest in leisure canal cruising compelled reconstruction of the waterways so that now it is possible to link up with the National Waterways system from Marple to London in the South and Llangollen in Wales. In the latter part of the 19th century, the town prospered due to the Cotton Industry. In 1936 the Urban District then part of Cheshire, was extended to include the Parish of Ludworth and Mellor, which was formerly in Derbyshire. The advent of frequent bus services in 1923 and rail services led to the growth of Marple as a residential area and with the decline of the cotton industry it is now mainly a dormitory town.